Deserts are growing constantly. The Sahara, the world ́s biggest hot dessert is getting even bigger. An area equal to Ireland is converted to desert globally every year. In consequence humans habitat is shrinking. It is a major thread to mankind, to the planet as we know it. There are many reasons why it happens. Scientists tell us, climate change and many other man driven activities have significant causes. There Is a Reason, Deserts Continue to Grow. If one is driving a phenomenon why can’t we counteract and balance such effects too? To focus on and address such a undertaking, we first need to understand some physics and the role of water in our atmosphere. There is a dynamic sun driven water cycle continuously active all over and everywhere. The oceans are the major water storage and biggest surface from where water is evaporated up into the atmosphere. From there it travels somewhere to condensate and fall down again due to gravity. It is a forever closed loop driven by our sun, the actual source of all energy on this planet. Sun rays evaporate water up into the air for it to cool down and condensate again. Air can basically dissolve a certain maximum amount of water in relation to temperature and pressure. The state of saturation for air with water means 100% moisture relatively to that point. If air of 100% moisture would be cooled further, water is subject to condensation, meaning drops of water would be generated. This happens regularly at points of mountain slopes, where air with certain moisture content is moving upwards. The best example are the southern Himalayan slopes, where monsoon rain is legendary. Basically air is subject to a dry adiabatic change of state in vertical direction when taken up due to reduction of pressure. As the pressure reduces, the temperature does too. This results in cooling of 1°K/100m of any particular potion of air. At the moment when saturation is crossed, the cooling is reduced to 0.5°K/100m due to change from dry to wet adiabatic change of state. That is because the internal energy which resided with water as vapor is now contributing to heat due to condensation. Now we simply need to define a location where rain is needed. Then take the ground condition of air into account and transport the air up until the point of saturation is crossed. Instantly it causes condensation, following rain as a logic consequence. This principle is so simple, that they came up with the idea of filling up a mountains in Dubai. It would obviously work, but what would the necessary height of this mountain be? Let’s take average weather conditions in Dubai as reference. From statistics in June temperature would be 30°C, with about 50% humidity. This means the absolute amount of water per one cubic meter of air in Dubai is equal to 15.18g in average. We can now calculate here, that we need to cool the air from 30°C down to 17°C in order to reach condensation, reaching the point of saturation. It is a difference ∆T of 13°K which further tells the answer: Our mountain is supposed to be a at a minimum of 1300m high, better close to 1500 – 2000m. Unfortunately this project would not necessarily cause rain, because the airstream is not always directed towards the mountain. Bad luck if the wind comes from the opposite direction, then all the rain would be generated on the backside, frontside would be even dryer. Huge efforts to fill up such a mountain would not be justified as the results are so doubtful. The Idea And Physics Are Plausible But Implementation Is to be Improved! 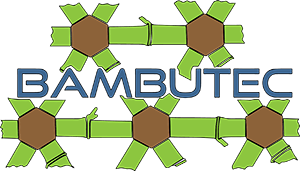 Now Bambutec Technology comes into picture. From our Postulate above we know that air is to be taken up a minimum of 1300m. Air can simply be taken up by thermal convection, just like eagles use it to gain height. What we can use is solar-thermal-power with a chimney and a solar energy collector. Basically very simple, so that projects have come up to use the upstreaming air to generate electricity by wind turbines but no water, because their chimneys were too short. 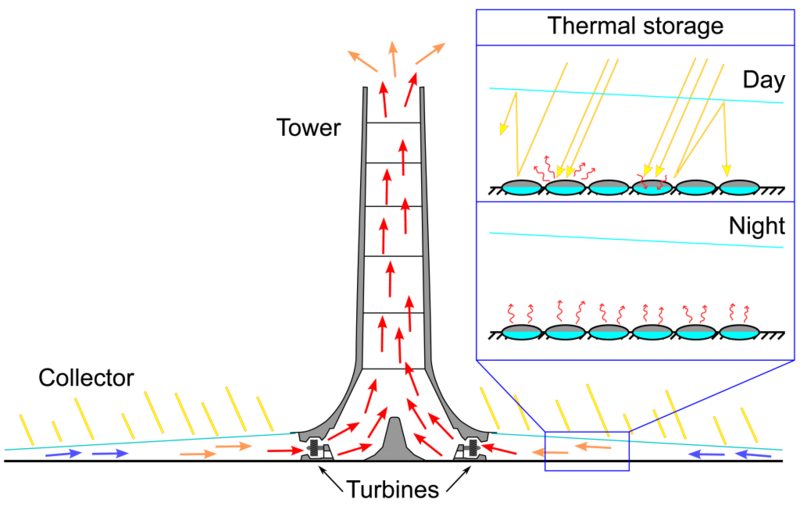 Schematic presentation of a solar updraft tower. Bambutec is proposing to built such a chimney sun collector to generate water. The circular collector radius would be approximately 4000m, the height of chimney would reach 2000m, as requirement for condensation. This Seems Very Provocative In Terms Of Feasibility, Doesn’t It? Lets compare basic mechanical properties of conventional building methods with Bambutec framework technology. Members of conventional welded steel frameworks carrying the same load weigh approximately five times more than Bambutec members. This fact is related to tensile strength rates of contrary materials wood/bamboo opposite to mild steel. Weight mass is the most important constraint in high rising structures, because the lower members need to carry all those above. A simple context ! Five Times Higher Than Burj Khalifa? Wait, five times lighter? Does that mean we could make a building five times higher than one made conventionally? That would be ground breaking, imagine we could build five times higher than Burj Khalifa, five times 3200m high. Yes, basically possible. But we need to take load cases into account which are immanent at that height. Atmospheric phenomenons like extrem wind loads for example. We might not reach 3200m with a needle like shape like Burj Khalifa. Just imagine that Mount Everest reaches 8848m, of course in a different shape! Another very powerful characteristic of organic materials is the much higher flexibility. Technical terms called e-modulus or modulus of elasticity. Bambutec-members are approximately ten times more flexible than steel members. Any complex structure made by Bambutec would respond to high loads with a collective response where all structural members instantly help together and each other. It might result in a bigger amplitude of movement due to load in that height. But it would be no problem for this application, and would protect the building against high loads very effectively. Another factor counts to make such a high building – geometry, meaning shape ! It makes no sense to rise a needle like structure. Better and much more effektive would be a pyramidical shape. A pyramid is so much easier, because the horizontal section of the building is increasing top to bottom accordingly with the dead load of the structure. This keeps the stress in the members constantly moderate. We do not want exactly that shape because the purpose of our rainmaker is collecting air, heating it and driving it upwards into a chimney. This shape would be more a kind of hyperbolic Paraboloid. We know projects called Solar Chimney Power Plant, SCPP, which consists of a flat circular collector and a tubular chimney in center. What Bambutec proposes is slightly different in shape with a gradually rising collector towards the center ending in a conical high rising chimney. This shape distributes the dead load of the structure to gradually increasing horizontal sections downwards according to the load. The chimney tends to become cylindrical in the upper end only. As a matter of fact, downwind of that rainmaker, there would be a continuous heavy rainfall 24 hours a day. Dependent on humidity and temperature on ground this rainmaker harvests 30 – 100 cubic meters of water per second. 100.000 liter/s, 360 million liter/hour, 8,64 billion liter/day. Imagine forests growing in deserts, tropical and subtropical conditions for farming without scarcity of water. In fact a microclimate around the rainmaker would be established and further improve efficiency in a closed loop. In big scale this could influence global warming even to opposite, because huge amounts of new plants would come up absorbing CO2. Believe Me Or Not, We Could Do It! Believe me or not, we could do it. Provided trustful partners with courage and appropriate financial background understand and join. This is so promising, tell me what you feel about it in the comments below!